As Georgia’s public medical school, we want to work even harder from multiple directions to improve the number of physicians providing great care to the citizens of our vast state. We talked in September about emerging plans to expand our class size here and in Athens that will take our class size from 230 to 300 within the next decade. Now I want to share with you exciting, emerging plans for an innovative curriculum and approach that will enable us to accelerate the process of educating primary care physicians for our state. For now we are calling it the accelerated 3 + 3 track because it will enable up to 50 medical students per class at a time to complete medical school in three years then move directly into a primary care residency for three years. We hope to start with family medicine, internal medicine and general pediatrics in the fall of 2020. But the math doesn’t end there because 3 + 3 = 6 and that means that we would like the students who commit to practicing primary care for six years in medically underserved areas in our state to have their medical school cost forgiven or even their tuition paid up front. Unfortunately, underserved areas are not hard to find in our state. In fact, 89 of our 159 counties are designated as primary health care professional shortage areas. While many important details are still evolving, please note that we also hope to expand to a 3 + 4 program in OB/GYN and 3+5 in general surgery, as there also are severe shortages of both, particularly in rural Georgia. As you can imagine, there will be a lot of moving parts and people to make this happen. We have to revamp our traditional four-year curriculum to ensure students learn what they need in a compressed timeframe. We will need to further expand our primary care residency positions and our work with hospitals across Georgia to enable them to expand further or start new programs, particularly in more rural areas. Please let me add that I am optimistic all this can happen based on the living proof of what has already transpired. That includes the tremendous success of the University System of Georgia’s GREAT Committee, which our Dr. Shelley Nuss helped lead, that likely will enable more than 600 new residency positions at new teaching hospitals in Georgia by 2025. It includes the tremendous support MCG receives throughout Georgia at our Partnership campus in Athens, at our regional campuses based in Rome, Albany, Savannah and Brunswick. It includes individuals like Dr. Doug Miller, senior associate dean for medical education, and our entire campus network and academic leadership. It includes the quality and passion of the students who want to come to MCG and of the graduates who have already been here. Essential to this movement is also the continued support of the USG, our legislators and governor and the approval of the Liaison Committee on Medical Education. All that said, I am excited and hopeful on these fronts as well. In the proud, 190-year-old tradition of MCG, we all want what is best for the wellbeing of our state. 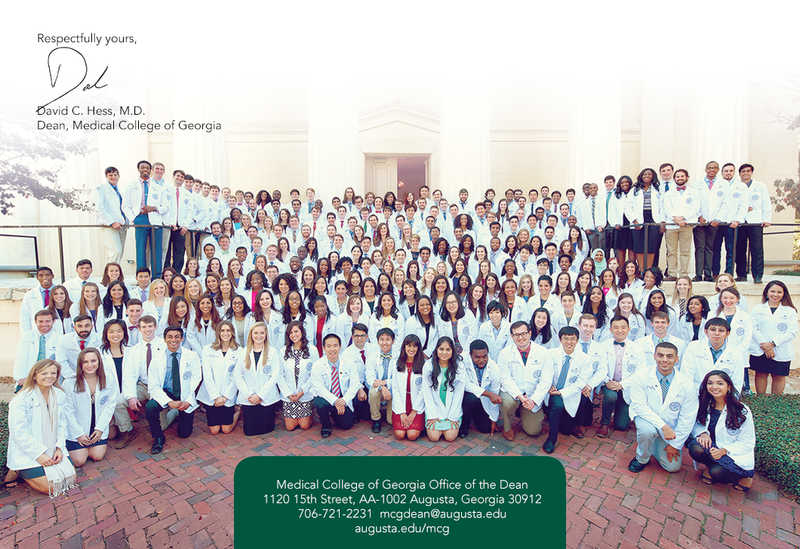 There are more than a dozen existing accelerated medical education programs in the United States, including places like Penn State and NYU College of Medicine as well as Mercer, here in Georgia. In fact, there is a Consortium of Accelerated Medical Pathway Programs, which started in 2015 with eight medical schools – five have joined since – to help develop best practices for these accelerated programs and provide overall support for this innovative approach. I certainly believe the approach will enable us to fight the good fight for better health in our state. We are the public medical school for a state that consistently ranks among the top 10 in population and population growth. Georgia is the nation’s 21st largest state with 57,919 square miles. We have a population of about 10.5 million with about 1.8 million Georgians living in more rural areas of our state, rather than cities like Atlanta or Augusta, according to the Rural Health Information Hub. Like so many in our state, we want those kind of high ranks when it comes to the number of physicians we have caring for citizens wherever they live in Georgia. That’s because well-trained doctors and improved access to health care enable better physical and economic wellbeing for us all. Evidence suggests this initiative will definitely drive up the percentage of MCG graduates who remain in Georgia to take care of patients and communities. Already about 40 percent of MCG graduates stay in Georgia. Also doing their residency at MCG drives that up to 60 percent and loan forgiveness should make it a remarkable 80 percent who stay right here. In the nation, states with the highest number of physicians per 100,000 population are concentrated in the Northeast, in states like Massachusetts, which has the highest number, while we are ranked 39th. When you look at our country in terms of the number of active primary care physicians per 100,000 population, you will find Georgia among the lowest at 41st. BTW, Massachusetts again ranks number one in this primary care ranking, all according to the Association of American Medical Colleges. Meanwhile, a 2018 healthiest state ranking by the United Health Foundation also put Massachusetts as one of the healthiest states – Hawaii was the only one that beat them – and ranked Georgia 39th. The fact is, Georgia needs more of every type of doctor, but we want to start by growing the primary care doctors first. I have never seen so much enthusiasm among our faculty educators and Academic Affairs office as I see for this initiative and hope you will feel the same. It goes straight to the heart of our mission. Speaking of an accelerated program, our Admissions Office, which typically interviews new applicants until March, has already finished that important task. That is largely because of a new process that provides better information about applicants in a shorter amount of time, which is a true winning combination. To put numbers on this, it essentially cut interview days in half, from 66 last cycle to 37 this cycle. That means more timely acceptance of outstanding future students and less time and demand on our faculty and other interviewers. A serious win-win. I want to thank Dr. Kelli Braun, associate dean for admissions and 2004 MCG graduate, and the entire Admissions Office again for the smart decision to do this and our Admissions Committee for lending such invaluable expertise. I can’t wait to meet the new students, the Class of 2023, who will be with us in August. Here is another great idea that will benefit many. The University Health Care System and AU Health System have partnered to provide care to some patients with cancer in our community. Under the agreement, our health system will operate University Medical Oncology’s outpatient oncology physician practices, oncology infusion centers and related pharmacy services at 1348 Walton Way in Augusta and 450 Society Hill Drive in Aiken beginning this June. The services and patients will physically stay where they are and there will still be equal, overall oversight by both health systems. University Medical Group oncologists will serve as medical directors of the locations and be members of the medical staffs of both health systems. I personally think this is a win-win for our hospitals and for patients with cancer from this region. Benefits include enabling more patients to have access to clinical trials happening right here in Augusta and the opportunity to work closely with our colleagues at University Hospital, some of whom are graduates of our medical school and/or residency programs. Ultimately, it also will enable us to move closer to meeting fundamental requirements for National Cancer Institute designation for the Georgia Cancer Center. See here and here. More great news announced this week is that Dr. Joseph Hobbs, 1974 MCG graduate and chair of our Department of Family Medicine, will be honored Feb. 8 with a community award from Georgia Bio, the state’s life science trade association. This award is a little different than the Georgia Bio norm, because it honors the Medical Minute, a weekly broadcast on 17 Georgia Public Radio stations that highlights research at MCG. Dr. Hobbs, the voice of the Medical Minute, has become quite the storyteller since this whole thing started in 2014. I want to thank Dr. Hobbs and GPB for this significant public information effort. I also want to thank Drew Dawson, station manager of the local GPB station, WACG 90.7 FM for helping us make impactful radio. Check it out here. Feb. 12 – Preparing for Promotion Workshop, 3:30-5 p.m., Health Sciences Building, EC 2207, presented by Dr. W. Vaughn McCall, MCG executive vice dean, and Dr. Lara Stepleman, director, MCG Office for Faculty Success. Register at facultysuccess@augusta.edu. Feb. 19 – MCG Alumni Association Board meeting, 3:30 p.m., and Macon Regional Reception, 6 p.m., both at the Idle Hour Country Club. Feb. 22 – Faculty Senate, noon, Lee Auditorium. Feb 23 – 8th annual Igniting the Dream of Medicine Conference, sponsored by the Medical College of Georgia Office of Student and Multicultural Affairs and its chapter of the Student National Medical Association, will welcome more than 500 high school and college students from across the state for a look at what it’s like to apply to and attend medical school. March 15 – Match Day, noon, Christenberry Fieldhouse (location may change). May 30-June 1 – MCG Statewide Faculty Development Conference, Teaching Tomorrow’s Physicians Today: MCG’s Mission for Georgia, Jekyll Island Convention Center, see https://www.augusta.edu/mcg/academic-affairs/eii/conference/index-1.php.